This is WIZnet Ethernet Interface using Hardware TCP/IP chip, W5500 and TCP/IP Offload Engine, W7500. 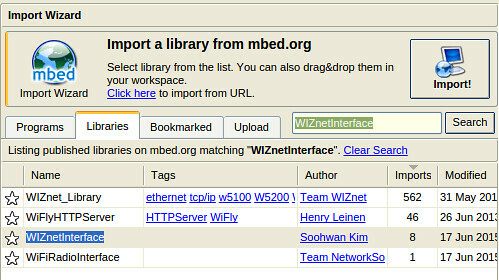 This is an Ethernet Interface library port-based on EthernetInterface. This is where the driver using TCP/IP offload(W5500/W7500), which is a market-proven hardwired TCP/IP stack, is implemented. Therefore, this library does not need lwip-eth.library. The Socket folder contains files that implement the SocketAPI and Protocols as like DHCP and DNS. The arch folder contains files that implement the driver for W5500 and W7500x_TOE. The eth_arch.h implement to select TCP/IP TOE depending on platform. The eth_arch.h file is added to select arch depending to Target platform, we used define of TARGET_platform. The link function is added to check Ethernet link (PHY) up or not. * Check if an ethernet link is pressent or not. The set_link function is added to check Ethernet link (PHY) up or not. * Sets the speed and duplex parameters of an ethernet link. DHCP and DNS lib moved in Socket folder. 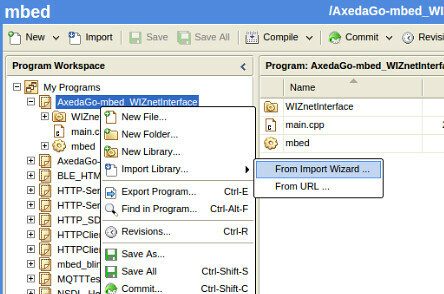 In import Wizard, input ‘WIZnetInterfae” in search box and click ‘Search’ button. 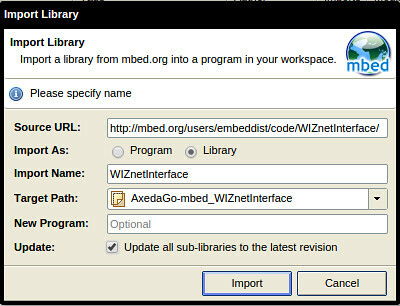 Click ‘WIZnetInterface’ in search result window and click ‘Import’ button.